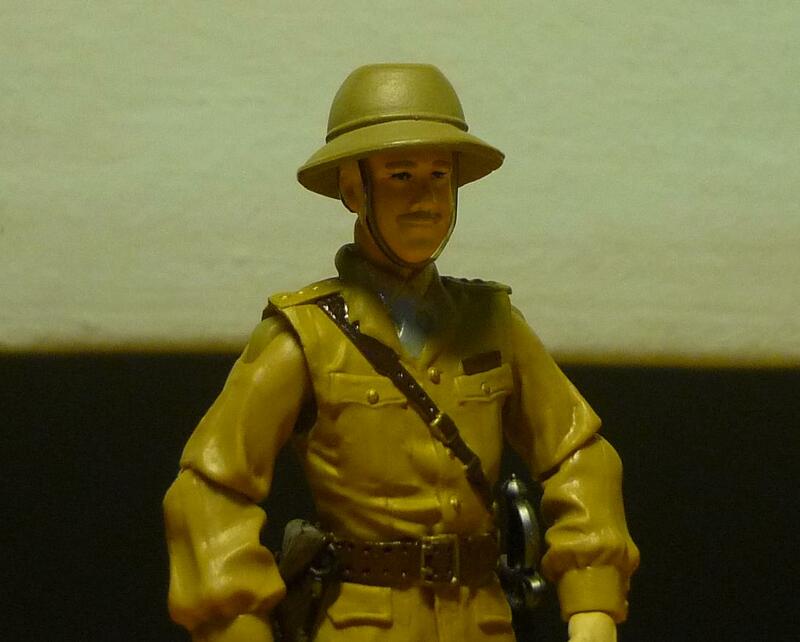 Here I showcase another of my awesome Indiana Jones custom figure ! The Cigarette Girl was going about her nightly routine of selling cigarettes to the patrons of Club Obi Wan when Indiana Jones arrived for an artifact exchange with the crimelord Lao Che. However, the negotiations went awry, and gunfire and pandemonium brokeout, resulting in mass chaos. The Cigarette Girl struggled to maintain an air of decorum even as people were running all around her. Unfortunately, Indy, already delirious after having drunk a poisonous beverage and receiving a punch from Lao Che’s henchman, he sees the Cigarette Girl and mistakes her to be another one of Lao Che’s associates, and proceeds to attack the Cigarette Girl likewise, punching her in the face and sending packets of cigarettes flying across the dancefloor. The Cigarette Girl is another background character in “Temple of Doom” that I saw fit to customise. 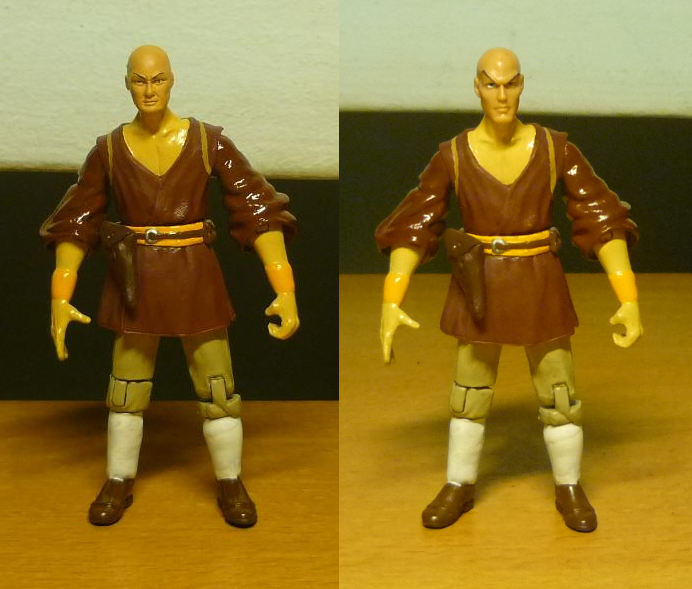 Originally, I had purchased Beru Whitesun as a possible substitute for Willie Scott’s head in this custom. 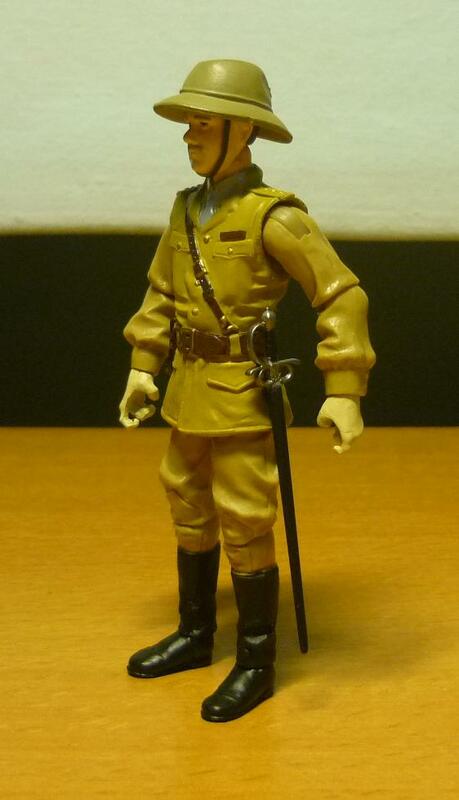 In the end I acquired another Willie Scott for the head, so Beru became available for use as custom fodder. After deciding on creating the Cigarette Girl figure, I determined that Beru’s face best resembled that of the Cigarette Girl. Padme Amidala is an often-used figure among customisers when it comes to creating the female form in dress, and Leesub Sirln provided the pair of bare female arms for the figure. The Cigarette Girl wears an outrageous amount of deco on her head which includes flowerings on her hair, an identical flower serves as her right earring, while on her left ear is a dangling black strand from a black earring. 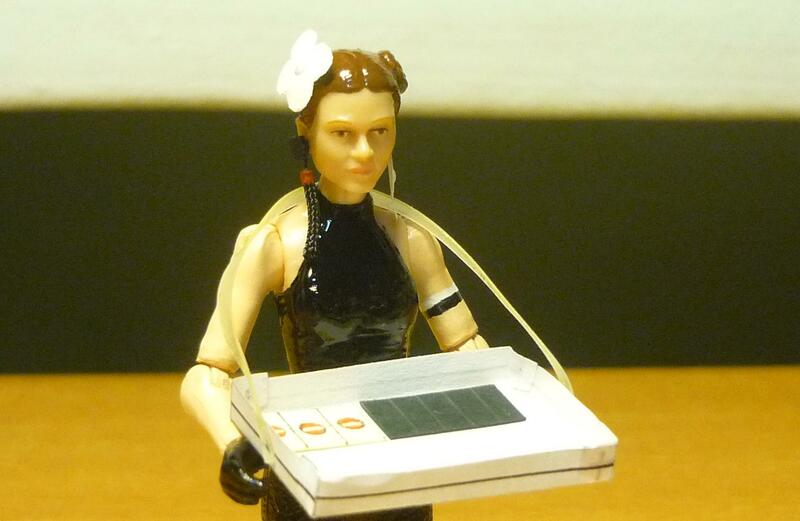 Epoxy was used to sculpt the dress top, and a black-white armband was painted around her upper left arm. For accessory I have made a tray out of paper and rubber tie, and the tray comes along with paper cigarette packs. 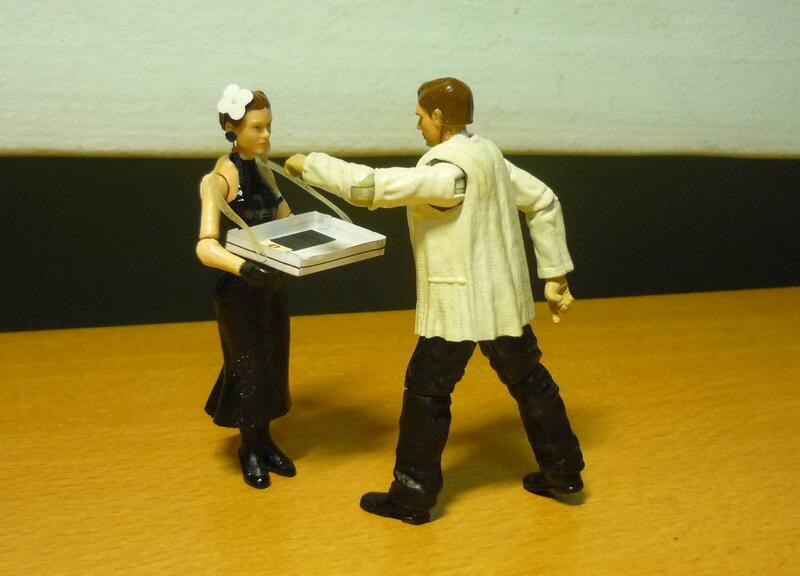 the Cigarette Girl got what she deserved. Club Obi Wan ensemble. 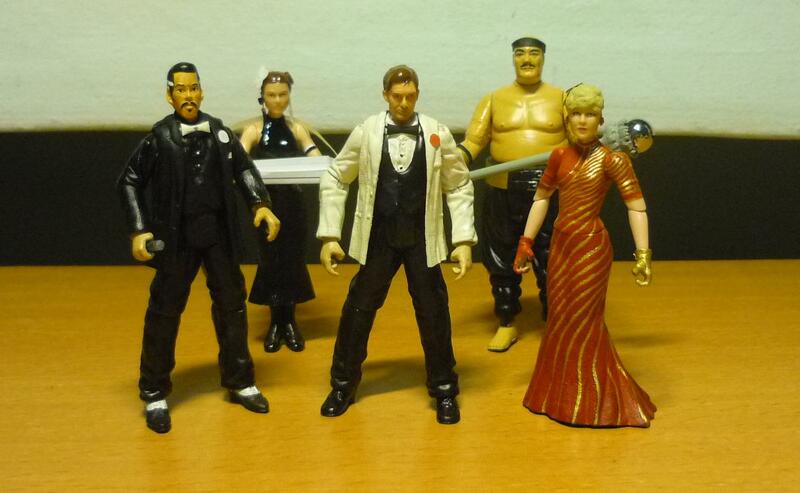 From left: Lao Che, Cigarette Girl, Tuxedo Indy, Gong Striker, and Red Dress Willie. And there will be more to join this particular diorama, once I find the time and inspiration to get around to them. 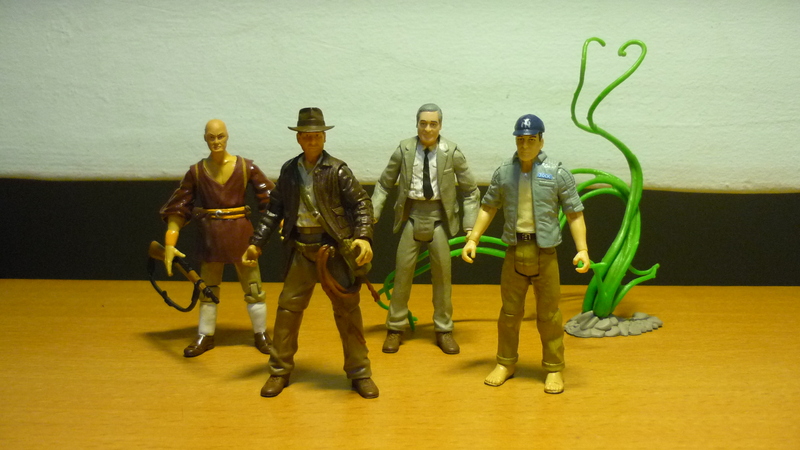 “Indiana Jones and the Temple of Doom” often gets a bad rap for being among one of the darker Indy movies, but I sure find lots of inspiration from this movie to do my custom figures! Captain Phillip James Blumburtt is an officer of the 11th Poona Rifles, a unit of the British Indian Army. 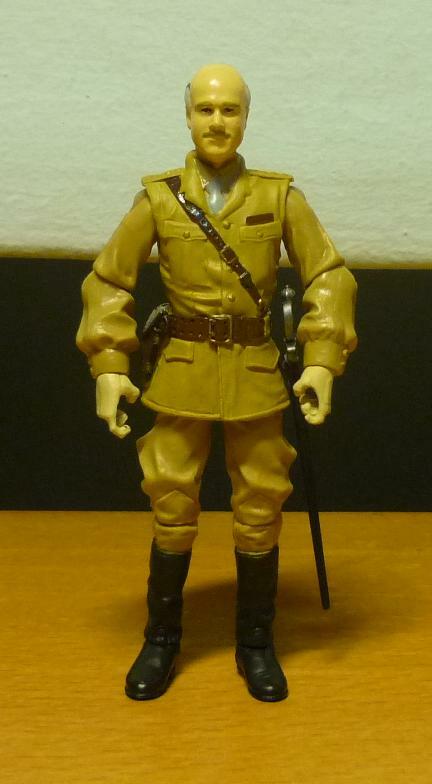 In 1935, Captain Blumburt and his men had arrived in Pankot Province on a routine inspection tour, and Blumburtt was invited to the royal dinner at Pankot Palace, which was also attended by Indiana Jones, Short Round and Willie Scott. Blumburtt listened with interest to the conversation between Indy and Pankot Prime Minister Chattar Lal, in which Indy insinuated that the evil Thuggee cult was on a resurgence at the palace. Captain Blumburtt does not appear again until the end of the movie when Blumburtt and his men arrived just in time to rescue Indy and his friends and defeat the remaining Thuggee guards. For the customisation of Captain Blumburtt, I used a new technique which converts a head with a swivel neck joint to one that can fit onto a ball joint neck. This involved using the dremel to hollow out the head, until the head can be appropiately plugged onto the ball neck joint. Dragonsky had a suitably bald head which I modified to resemble Blumburtt by using epoxy to sculpt the hair that was still remaining, and painting on the moustache. Most of the figure comes from Dovchenko, whose Soviet army uniform I modified by using epoxy to sculpt the lapels, tie, and pockets. A small piece of rubber tie was used to create the badge above the left chest pocket. Blumburtt’s sword is actually made by attaching the hilt of Mutt’s sword onto a short length of plastic stick, which itself was originally the antenna of a World Peacekeeper military motorcycle. Here’s a picture of Blumburtt wearing his pith helmet complete with helmet strap. The helmet comes from Sgt. Misha Zubenkov of G.I. Joe, and I am sharing the helmet between Blumburtt and another of my customs Peruvian Belloq. Another picture of Blumburtt, this time sans helmet. Blumburtt only appears in his service uniform at the end of “Temple of Doom”, in his earlier appearance during the palace dinner, he was wearing his dress uniform. So, you don’t really see Blumburtt in his service uniform with his helmet off. I’d like to point out a slight inaccuracy here. The sword has a different hilt from that which appears in the movie, which has a basket-shape guard. Given that Blumburtt’s sword only appears fleetingly for a fraction of a second onscreen, I hope nobody would notice that much. Here we have two Mutt Williams from “Indiana Jones and the Kingdom of the Crystal Skull”. 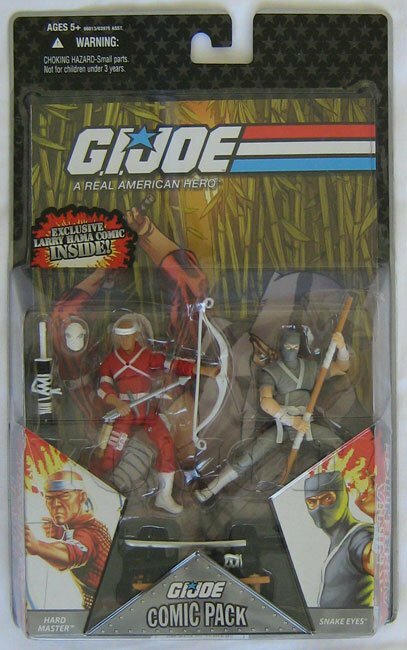 From left: Mutt Williams with sword, and Mutt Williams with snake. Note that in KOTCS, Mutt Williams never appear without his black leather jacket. So we do not actually see Mutt only with his T-shirt and jeans, except perhaps during the behind-the-scenes interviews on the KOTCS DVDs. 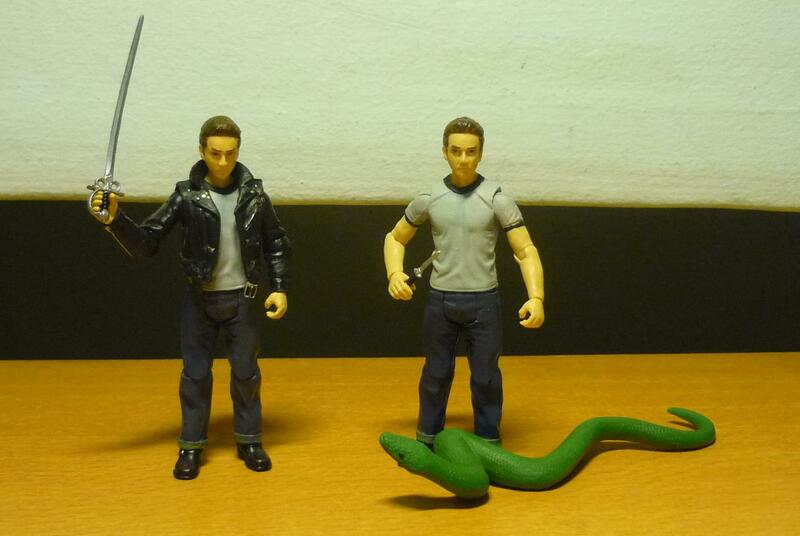 Mutt Williams with snake is a useful custom fodder for figures with bare forearms. In 1936, Indiana Jones traveled to Tibet in search of Sir Francis Beresford-Hope, who had in his possession an artifact that could possibly unlock an ancient mystery. 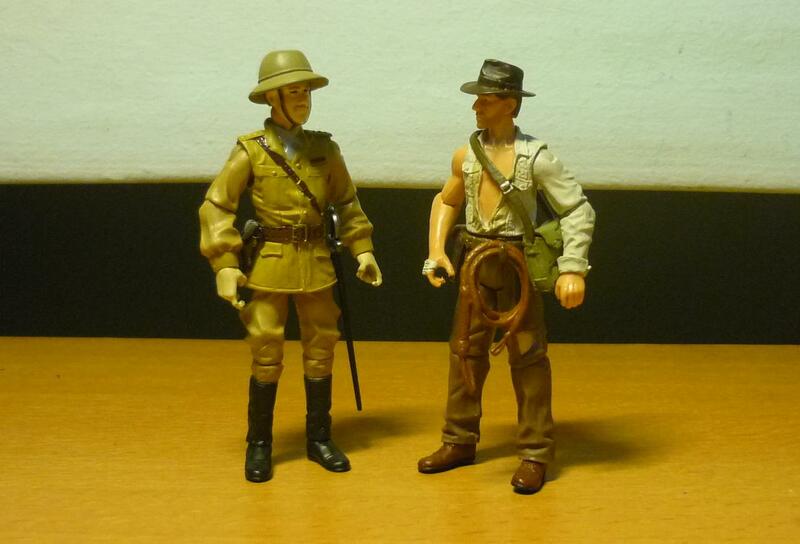 Instead, Indy met Beresford-Hope’s son, Alex, who informed him that his father had died. Alex then teamed-up with Indy as they escaped from the local bandits and embarked on an expedition to the icy wastes of Sibera where the ancient mystery is said to be hidden, racing against a team of Nazi zealots who were also after the very same goal. 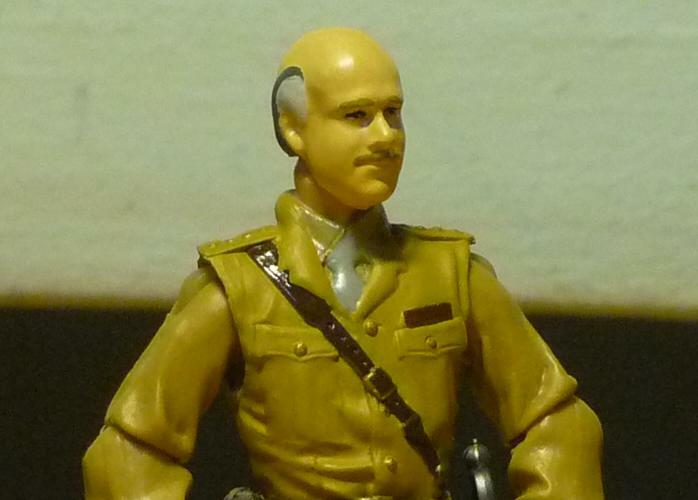 This is another case whereby I bought a figure specifically for the head, that of Hard Master, whose head I thought resembled that of Alex Beresford-Hope. And I also felt that Alex’s attire was the same as that of Plo Koon, a Star Wars figure. Plo Koon’s torso was hollowed out using a dremel, and the Cemetary Warrior’s chest was cut to fit into the outfit. The arms from the Cairo Henchman were transplanted over to the figure. Epoxy was used to sculpt the wristbands and socks. An Indy holster was attached to the belt, and finally an Indy satchel was attached to the back to serve as Alex’s backpack, with the straps actually painted on. There is a backpack behind Alex. From left: Alex Beresford-Hope, Indiana Jones, Marcus Brody, and Jock Lindsey the pilot. In the comic, the ancient mystery site buried beneath Siberia was surrounded by green alien-looking vines. You can see four Indys here, one from each movie. 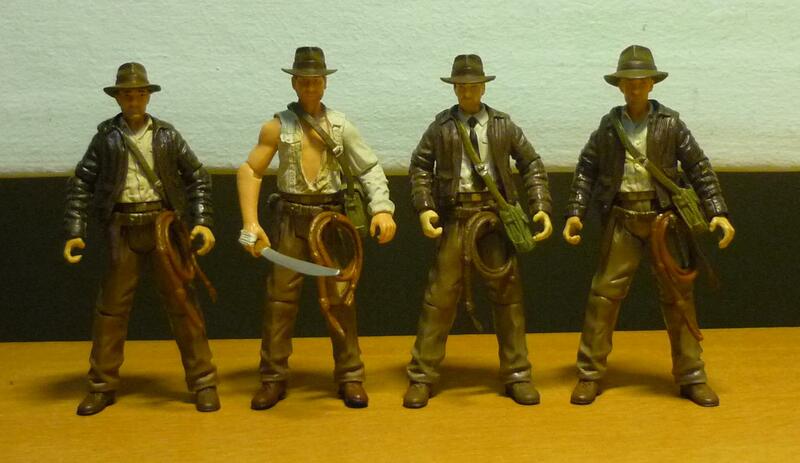 From left: (1) Indiana Jones from “Raiders of the Lost Ark”, (2) “Temple of Doom”, (3) “The Last Crusade”, and (4) “Kingdom of the Crystal Skull”. Notice that for KOTCS, Indy wore his satchel on the outside of his jacket, whereas for most parts in the first three films he wears the satchel on the inside of his jacket, as in appearance (1). One day, my Dad and I went to the Bukit Timah Nature Reserve. I wanted to visit a sports shop there as I was thinking of buying a pair of mountain shoes for an overseas hiking trip. Unfortunately, the shop was already closed. But along the way, we came across numerous wild monkeys which were frolicking about on the grass, grooming each other, and helping themselves with fruits and food plundered from nearby rubbish bins. Their carefree mannerisms both amused and intrigued us. For several years, the National Parks had been releasing monkeys (specifically the long-tailed Macaques) into the Singapore forests to help repopulate the species. Given the numerous instances of monkeys invading private residences to steal food, and the incessant feeding of monkeys by law-breaking citizens, I should say that NPark’s efforts at raising the awareness of wildlife conservation among Singaporeans had been met with a considerable degree of success. The sight of so many monkeys inspired my father to comment: “猴子是人的远亲” – which translates to “Monkeys are distant relatives of Humans”. Hmm… I know of a couple of people who would take serious offense at that statement. Yet again, they also think that Yoga is evil, and that the universe was created in six days, but I’ll leave all that as a blog to rant another day. Obviously, my Dad was making a reference to the Theory of Evolution, which as suggested by Charles Darwin from his 1859 publication “On the Origin of Species” that Humans today evolved from apelike ancestors through a lengthly process of natual selection, adaptation, survival of the fittest, and probably even mutation. Being a person of scientific thinking, personally I find the idea that man could have evolved from apes to sound logical and it is possibly credible. Though I know of someone who totally outright rejected the Theory of Evolution since “he hasn’t seen any monkey turn into a man yet”. Interestingly, my Dad’s comment inspired me into thinking what exactly are the implications of his comments, and it wasn’t very long before I came to the logical conclusion which I expessed by replying: “人是猴子的远亲!” – “Humans are distant relatives of monkeys!” Actually, that statement sounds more amusing than it was logical, as me saying it implies that we are the monkeys! Living about our carefree lives in this urban jungle! On this note, I would like to mention of the upcoming movie “Rise of the Planet of the Apes”, which I assume would be a remake of the classic “Planet of the Apes” movie series, excluding the faux 2001 Tim Burton version. The “Planet of the Apes” series told of the story of… the planet of the apes, and I am not going to spoil the story for you by going any bit further into the details. What you can know about the upcoming movie, you can see for yourselves from the movie posters or movie trailers, the latter of which I am going to avoid since I choose to keep myself unaware of the storyline until I can surprise myself by what I see in the cinema. Rise of the Planet of the Apes. Coming soon.